I've been meaning to mention that the problem of dog-do on the sidewalks of Paris is disappearing. In past years, I wrote about the concerted effort to get people to "ramasse" -- i.e., to clean up after their dogs. Last year, I told you about the new, high fines for not cleaning up after one's dog (also high fines for littering). The fines are now 185 euros for first offenders, and 450 euros for recidivists. Well, that seems to have done the trick. And the bureaucrats have made it as easy as possible for dog owners to comply with the law. They even provide plastic bags in dispensers like this in many of the parks. The dispensers even have instructions (see diagrams at left) on how to use the bags! The result is that the sidewalks and parks in Paris are now no dirtier than they are in big cities in the States. Which is to say that things aren't perfect -- "crotte" can be found on the sidewalk here and there. But we don't have to constantly scan the surface ahead of us to be sure we don't befoul our feet. 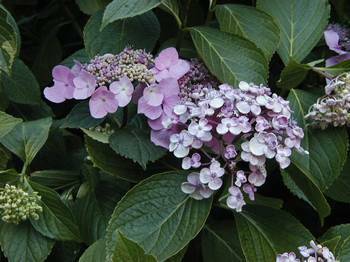 Hydrangea in the Square Charles Peguy in the 12th arrondisement. We've been reading a lot for the past few days. One item from Le Figaro's weekend edition will be of interest to fellow Floridians. It is about the "mythical St. Tropez in agony." Like Sanibel, St. Tropez has about 5,000 permanent residents. In the summer tourist season, the population swells to 75,000! Sanibel's winter population only swells to 25,000. According to the newspaper, one "must" go to Saint-Tropez at least once in one's life, to amble through the scenic port and to see the celebrities there. But the celebrities are increasingly rare since they tend to stay in their protected villas during peak season. They don't like the "aggression" of the tourists. It seems that after the war (WWII, I assume), Saint-Tropez attracted mainly artists of various kinds. Cartoon on the side of a party-supplies-and-set-up truck parked near the Opera at Bastille. The "snobisme" did not come until later. Back in the 40s and 50s, it was a place "pure and beautiful, and the people were beautiful and receptive." "We laughed a lot and people didn't judge each other," said Juliette, a longtime resident. And then Bridget Bardot came, as well as Eddy Barclay and his parties. And all the other show-biz types started to come. "The tourism may put an end to the values and attractiveness of the village," says one inhabitant. Just as it threatens to destroy the things in Florida that attracted tourists in the first place. Stuffed crocodile in an antique shop in the Place des Vosges, 4th arrondisement. 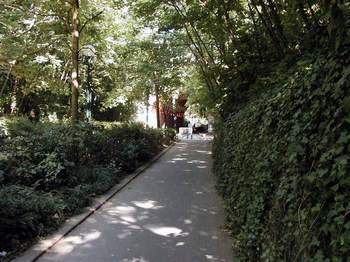 On Monday, we walked along rue de Vaugirard, Paris's longest street, from our neighborhood to the Luxembourg Gardens. This takes a little over an hour. While not the most scenic or romantic part of Paris, the route does take us through an important part of the city -- where the well-known Pasteur Institute and Necker Children's Hospital are located. By the way, last weekend's Music Festival included a concert for the children at Necker. We heard good brass band music being played by an enthusiastic group of students just outside the Luxembourg Gardens. Music is celebrated every day in Paris. You can't escape it. Tom wishes he could avoid accordian players in the metro. 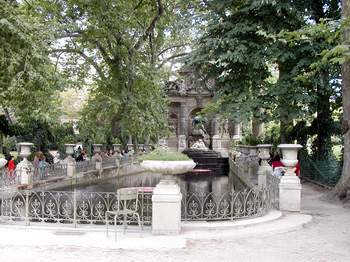 When we go to the Luxembourg gardens, we like to stop for drinks at the kiosque in the east side of the park. Here there are lots of tables and chairs under huge old chestnut trees. Pigeons visit us while we consume our beverages (which are VERY reasonable priced, by the way). 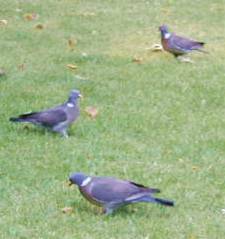 We like to look for the "pigeons ramier" or "palombes" as opposed to the "pigeons ordinaire." The special pigeons are prettier, and more regal. There are a few pairs of them mixed with the ordinary ones in this favorite part of the Luxembourg Gardens. "M. Jean-Louis Carrère: Je souris lorsque j'entends dire qu'on va autoriser la chasse à la palombe de telle date à telle date. A Paris, on ne l'appelle pas la palombe; pourtant, il y en a partout. Les Parisiens ne savent pas ce que c'est. Il y en a dans le jardin du Luxembourg ! 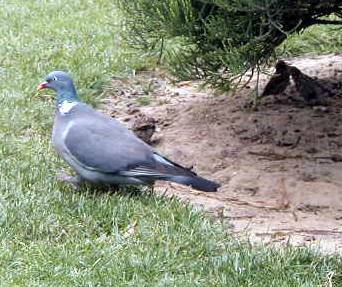 Il s'agit du pigeon ramier, ce bel oiseau qui a des bandes blanches et qui, quand il vieillit un peu, a un collier magnifique autour du cou. Il a une apparence beaucoup plus belle que le pigeon ordinaire." Translation: "I smile when I hear it said that we're going to authorize the hunting of the palombe from this date to that date. In Paris, one doesn't call it the palombe; nevertheless, it is everywhere. Parisians don't know that it is. It is in the Luxembourg Gardens! The pigeon ramier, this beautiful bird who has white bands and who, when it ages a little, has a magnificent collar around the neck. It is much more beautiful than the ordinary pigeon." We also always visit the Fontaine des Medicis when we are in the vicinity. Sorry this pic (at left) is from last year. I didn't take the camera with us on Monday. I must take a new photo sometime this year because the bureaucrats have added an ivy covered wire sculpture of a dragon to the fountain's pool. That evening, we ate near St. Sulpice at Le Seraphin (5, rue Mabillon, 5th arrondisement, 56-24-41-00) where we both had duck in a rich wine sauce. Yumm. Highly recommended. It's where we had dinner with my mom and dad last year when they visited us in Paris. Tuesday was Tom's birthday, so he decided where we went and what we did all day. It was fun. We took the number 8 metro to the Bastille. From there, it was an easy walk down the rue St. Antoine to the Place des Vosges. 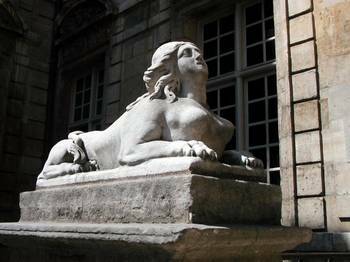 We always walk around the entire Square Louis XIII when we go to the Place des Vosges, but we also take time to exit the southeast corner and go into the courtyards for the Hotel de Sully (shown at left, with the sphinxes). This fine house was built in 1625. The house is now home to temporary exhibitions, and part of it is used for the Caisse Nationale des Monuments Historiques et des Sites. 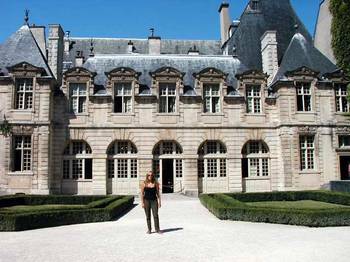 Even the Orangerie (also built in 1625) for the Hotel de Sully would make a fine house for us. Don't I look like I belong here? Exiting the Hotel de Sully put us right back out on the rue de St. Antoine, a party and celebration place ever since the 14th century. In a game that went wrong here in 1559, Henry II received a fatal blow to his eye. His opponent, Montgomery (the Scottish captain of his guard) was subsequently executed. 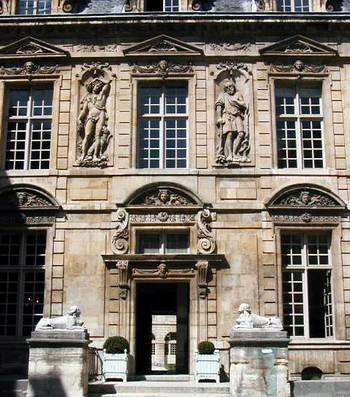 The Michelin green guide claims that the rue St. Antoine was the city's most elegant street in the 17th century, when the Hotel de Sully was built. We walked back through the Place de la Bastille, past the Opera house, and on down the Avenue Daumesnil, where we admired the shops housed in the huge arches under the Viaduc des Arts. 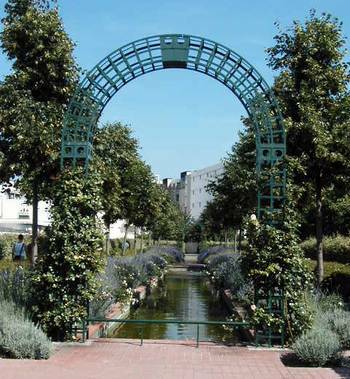 The Viaduc is a former elevated train track that was decommissioned and turned into a very, very long elevated park. It ends in the Jardin de Reuilly. 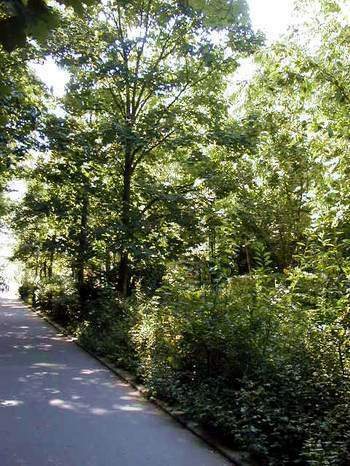 But one can continue the long walk by taking the Allee Vivaldi to the Promenade Plantee -- both of which are also parts of the old train track site. 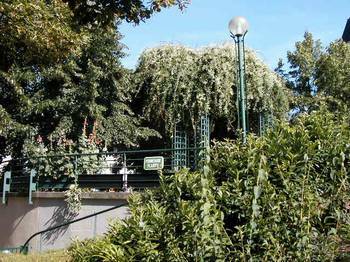 In prior years, we've stopped at the Jardin de Reuilly - a place full of sunbathers and children in summer. But we went on through Allee Vivaldi and Promenade this time. This took us almost all the way to the Bois de Vincennes! The walk terminates at the Square Charles Peguy. In one of the cave-like underpasses of the Promenade Plantee, rock outcroppings have been created with fake springs flowing over them. The water sounds have a soothing effect. You can see one of the underpasses in the photo at right. It was easy to find the number 8 metro from there. We took it home and had a delightful birthday dinner at Oh! Duo, where we are always warmly received. In some cases, the promenade goes up and over streets, as it does in this place (at right).